If anyone is interested, Skagit Power Sports, in Burlington WA is having a showing of the new yamaha adventure tourer this Sat. Just double checked on this and it will be a slide show and question session starting at 5PM. this Sat. Very tempting but all I would gain over my C-10 is 200CCs, a smaller windscreen and lose 200#s. It would be nice not having all that weight and still have a 6 gal tank. But retired with a fixed income it just is not going to fly. It looks nice. But most of those style bikes are too tall for me. Well at least to get on it! I always find it a bit amusing when retired folk (like me) use the term "fixed income." My income was "fixed" before I retired. Besides, how it can be "fixed" when I'm always "broke." I was surprised that I could "flat foot it" with my street shoes and the seat in the highest position. It can move a full inch down from there. I'm 5'10" and have a 30" inseam. I was wearing Sketcher "shape ups" which do have a thick soul. The spec sheet says "33 1/4" to 34 1/4" seat height, but it felt a lot lower than that. Jim, What happens to dog when it gets "fixed"? Some important parts are removed. Well my income has been fixed, as in some important parts have been removed, like the discretionary part. I wish I could get my income fixed. Yeah, I started out with nothing. And I still got most of it left. Ain't that the truth... dang it's been slow this summer... not looking forward to this winter, my usually slow season. And yeah on the luggage... it has that rugged adventure look, but in reality they are usually very weenie in construction. I like the connie luggage, fewer pieces to come apart. I was pleasantly surprised with how the Tenere felt to sit on. I think it would be a fun bike to own, but as a second or third bike. I would certainly buy a C-14 before a Tenere. Brady Portland,OR 2006 FJR 1999 Concours--COG#9006 MSF RiderCoach since 2005 "The most important modification you can make to any motorcycle is to improve the skills of its rider"
I LOVED test-riding this bike at the Dallas Cycle World show... it was awesome. 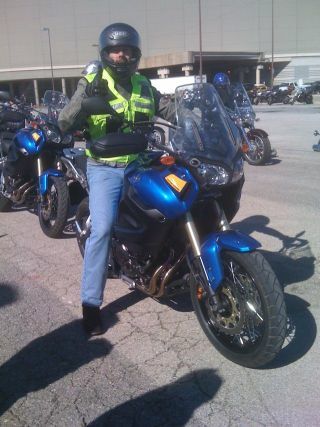 I'm thinking heavily on getting rid of my cruiser and picking up some version of adventure sport bike. I placed my pre-order last Thursday. I haven't decided whether or not I will keep the C14 and won't decide that until I ridden the Super Tenere for at least 2k miles. Like all the other pre-order folks I am wishing for an early Christmas present...even tho I know it isn't going to happen! The last time I pre-ordered was for an FJR and after one year it was gone. Just wasn't the bike for me. p.s. Always remember that when you retire all of your "income" suddenly becomes "Out-go"! They let you test ride it? It sure looks like my next bike. Better than a GS for much less money. I'm hoping someone on here will get their hands on one and give us a report. By the way, I read that the luggage is Fiberglas with aluminum panels. I wasn't impressed with the non-standard OEM luggage.